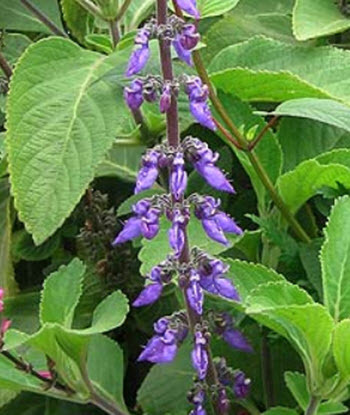 Forskolin is a labdane diterpene produced by the Indian Coleus plant (Plectranthus barbatus). An earlier scientific name for this plant was Coleus forskohlii, and the name forskolin is derived from that. Forskolin is commonly used in laboratory cell biology research to increase levels of cyclic AMP by stimulation of adenylate cyclase. Forskolin, or parts of the Indian Coleus plant, has a long history of use in folk medicine in various parts of the world, including the Ayurveda tradition. Forskolin is a smooth muscle relaxant that also exerts activity on inflammatory mediators, including interleukins and histamine, and on calcium ino influx. Because of this, it is currently being evaluated for the treatment of asthma. Forskolin is marketed by numerous food supplement producers as a powerful weight loss aid, but reliable clinical evidence is lacking in this area. Forskolin activates the enzyme adenylyl cyclase and increases intracellular levels of cyclic AMP. Cyclic AMP is an important second messenger in the human body. Without it, a cell can not respond properly to hormonal signals or other extracellular signals. In the human body, cyclic AMP activates certain pathways, such as Epac and protein kinase A. In clinical studies, oral forskolin performed better than sodium chromoglycate for preventing asthma attacks in children and adults with mild to moderate persistent asthma. In animal studies, forskolin exposure has led to increased melatonin production and more melanin being present in hair follicles. Forskolin has been shown to inhibit platelet aggregation in vitro. There is currently no clinical data available regarding this antithrombotic effect. Positive inotropic action has been demonstrated in isolated guinea pig, rabbit, and human heart tissue, and in vivo in cats and dogs. Forskolin demonstrated potent antidepressant activity in a rat forced swimming experiment. Forskolin has been shown to prevent induced seizures in mice. Case studies showed a transient mood elevation in some depressed and schizophrenic patients after receiving intravenous forskolin infusions. Examples of reported side effects from forskolin use are tachycardia and arrhythmias. Forskolin should be avoided in patients with polycystic kidney disease. It’s safety during pregnancy and breastfeeding is unknown. Embryo-related toxicity has been reported, but the findings are inconclusive. Indian Coleus is a perennial herb belonging to the mint family (Lamiaceae), and it is a close relative of herbs such as Mexican mint, Cockspur flower and Mosquito bush. Indian Coleus is native to tropical and subtropical parts of the Indian subcontinent and eastern Africa. The plant, which can be up toward 60 cm in height, produces large, soft leaves. The flowers grow in clusters and are purplish-blue. In traditional folk medicine, Indian Coleus is often consumed in the form of a tisane (herbal tea). Analysis of tisanes made from Indian coleus show that they contain compounds such as rosmarinic acid, diterpenoids and flavonoid glucuronides. To treat digestive issues, such as stomach ache and nausea. Sometimes used as a purgative.